This article is about alkyl nitrites as a laboratory reagent. For their use in medicine and as a recreational drug, see Poppers. Alkyl nitrites are a group of chemical compounds based upon the molecular structure R-ONO. Formally they are alkyl esters of nitrous acid. They are distinct from nitro compounds (R-NO2). The first few members of the series are volatile liquids; methyl nitrite and ethyl nitrite are gaseous at room temperature and pressure. The compounds have a distinctive fruity odor. Another frequently encountered nitrite is amyl nitrite (3-methylbutyl nitrite). Alkyl nitrites were initially, and largely still are used as medications and chemical reagents, a practice which began in the late 19th century. In their use as medicine, are often inhaled for relief of angina and other heart-related symptoms of disease. However, when referred to as “poppers“, alkyl nitrites represent recreational drugs. 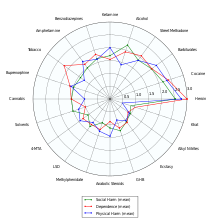 Addiction experts in psychiatry, chemistry, pharmacology, forensic science, epidemiology, and the police and legal services engaged in delphic analysis regarding 20 popular recreational drugs. Alkyl nitrites were ranked 20th social and physical harm, and 18th in dependence. Organic nitrites are prepared from alcohols and sodium nitrite in sulfuric acid solution. They decompose slowly on standing, the decomposition products being oxides of nitrogen, water, the alcohol, and polymerization products of the aldehyde. They are also prone to undergo homolytic cleavage to form alkyl radicals, the nitrite C-O bond being very weak (on the order of 40-50 kcal mol−1). n-Butyl nitrite and ammonia convert phenylhydroxylamine to its nitrosamine derivative cupferron. Likewise pyrrolidine is a substrate for ethyl nitrite. Alkyl nitrites are also used in the formation of oximes with the stronger carbon acids and acid or base catalysis for example in the reaction of 2-butanone, ethyl nitrite and hydrochloric acid forming the oxime, the similar reaction with phenacyl chloride, or the reaction of phenylacetonitrile with methyl nitrite and sodium hydroxide. Amyl nitrite is used medically as an antidote to cyanide poisoning, The light alkyl nitrites cause the formation of methemoglobin wherein, as an effective antidote to cyanide poisoning, the methemoglobin combines with the cyanide to form nontoxic cyanmethemoglobin. First responders typically carry a cyanide poison kit containing amyl nitrite. ^ “Amyl Nitrite”. Medsafe. New Zealand Medicines and Medical Devices Safety Authority. 2000-05-18. Archived from the original on 2006-11-11. Retrieved 2007-03-15.